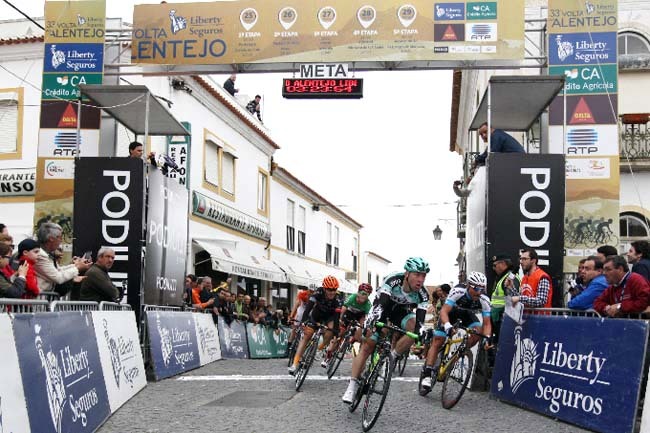 The Orange & Black of Optum successfully delivered Ryan Anderson to a third place finish in stage two of Volta ao Alentejo, vaulting the Canadian all-rounder further up the general classification. Anderson stayed focused through an extremely chaotic finale, which saw the front of the race jumping an unmarked median at top speed. He catapulted off of a Guillaume Boivin lead-out to contest the win on a narrow, cobbled uphill finishing straight. His time bonus at the line vaults him into fifth place on general classification, six seconds off of yellow jersey holder Manuel Cardoso of Team Tavira. It may not look like a hard-charging sprint finish, but it was – the celebration was delayed due to a technical, steep run-in and a close battle for the line. 153 km day, generally flat, some wind. The guys were good today. The Portuguese teams were happy to have a sprint, and also let Axeon control the yellow jersey they earned yesterday. There was a brief split in the field due to crosswinds at about the two-thirds point. As planned, we were well placed, so it didn't hurt us. The various groups rolled together without any drama. We were banking on a field sprint scenario and this is what developed. Our lead-out marque was around the 4 km-to-go point, and we were lined up at the 7 km point. However, it was a little argy bargy and we hit it hard around the 5.5 km point. We rotated three guys (Naud/Zwizanski/Selander) as long as they could and this took us inside the last 2 km. On one of the final roundabouts coming into 1 km to go, there was a full-length median that was not in the [race] bible, or marshalled by police for that matter. Pretty much the whole front half of the field (including our guys) followed the commissaire motos through the left side of the roundabout only to find that there was no opening to get into the final right hand sweeper that led to the line. Ryan and Guillaume were a little overtaken and they followed about 20 guys who jumped over the median to get into the final corner. Ryan and Guillaume worked well together over the final 750 metres. Ryan sprinted hard uphill and made it onto the podium, taking a nice little time bonus for third on the stage. The GC lead is now shared between two teams, Tavira and Axeon. Tavira wants sprints, Axeon doesn't. We're going to side with Tavira and do our best to roll them on the very technical finish of tomorrows 190 km stage. Ryan is sprinting well and the guys are good for lead-outs, so our best hope is that Tavira, W52, Efapel, and the other Portuguese teams wear each other out on the front of the peloton while we chill and then hit them hard in the final run-ins. At the end of the day we have to simply be passively aggressive, and look for our chances.